Your dog is looking at you with those big brown eyes. Your heart melts, and you reach for a treat. His tail wags, and you feel content. According to Ernest Ward, DVM, chief-of-staff at Seaside Animal Care in Calabash, North Carolina, and president of the Association of Pet Obesity Prevention, instant gratification comes in healthier forms. It’s easy to start a puppy out on this regimen. 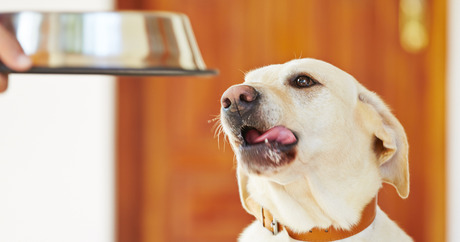 It’s more challenging changing behaviors of pet owners who have overfed their dogs over the course of several months or a few years. In those cases, your dog expects to be rewarded with extra food and treats. You can feed dogs plain ice cubes or ice cubes with tiny bits of fruit in them. It’s a good option on hot days. He also suggests refilling the water bowl often with fresh water. In addition, Dr. Ward gives his dogs vitamin supplements-mainly lecithin and omega 3 fatty acids (fish oil). Lecithin and omega 3 support brain health. Michele C. Hollow is a freelance writer/editor specializing in pets, wildlife, health, and family travel. She is the author of the soon-to-be released book The Everything Guide to Careers with Animals.